Our vision statement: "Together, Blessing Lives through Courage, Responsibility, and Love"
Job requires the exercise of discretion, independent judgment, and strategic decision making. This position requires the performance of office and field work directly related to the general business operations of MBCG, LLC dba Home Instead Senior Care. This is a supervisory position as defined by NLRA section 2(11). You must possess a current RN license with the State of Oregon. You must have experience with and a love for seniors. You must have intimate knowledge of the medications commonly used for geriatric populations. You are respectful, warm, organized, detailed, adaptable, and consider yourself a great leader. You must have a current driver’s license, auto insurance, and reliable vehicle. You will receive reimbursement for on-the-job mileage. This position is for 30-40 hours per week. Able to start part-time and work into a full-time schedule as caseload grows. Work hours are primarily Monday - Friday beginning around 8 a.m. Hourly wages will be $35 to $40. Open to discussion and negotiation prior to offer. Newly built out and furnished office space with plenty of daylight, room, and accommodations. A job you will love coming to each day! A company you can be proud of. The TV ads will warm your heart. Experienced franchise owner, Mike Brunt, is a leader you can respect and trust. Learn more at www.homeinstead.com/352. Ensure safe and effective delivery of medication services to clients. Train CAREGivers to competently document and administer client medications. Ensure client satisfaction and retention through quality assurance home visits, competent caseload management, and frequent touchpoints with clients and their representatives. Monitor and grow medication services as an area of focus for the agency. Maintain high standards of performance and accountability for self and others. Keep a sharp focus on the department goals and supporting performance metrics. Facilitate optimal communication, process orientation, and teamwork with the other teams and departments in the agency. Report to the agency director and the business owner in both regularly scheduled meetings and on a daily basis. Reflect the values of MBCG, LLC dba Home Instead Senior Care. Maintain high standards of professionalism, optimism, integrity, and respect. 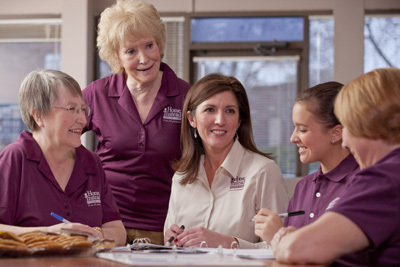 Provide 4-hour medication training to CAREGivers each week. Training includes return demonstrations and the evaluation of CAREGiver competence. Conduct 90-day quality assurance visits in the homes of clients who receive medication administration services. Focus on service quality and client retention. Monthly oversight of client medication administration records used by CAREGivers in client homes. Objectives are to monitor accuracy, improve safety, and ensure quality of medication services. Keep current on client medication lists and orders through regular contact with client doctors and other health care providers. Work directly with clients, families, and pharmacies to perform and/or supervise the filling of secondary medication containers in client homes. Help grow the base of medication services clients. Effectively influence prospective clients to start service by skillfully communicating the value proposition of our agency. Actively participate in regular meetings with the agency owner, director, and other key staff members. Responsible for maintaining accurate and complete client files and records in compliance with client privacy guidelines, HIPPA regulations, and Oregon Administrative Rules. Manage risk in high acuity client care cases in coordination with other leaders and key players in the agency. Proficiently use agency’s tech systems for the best benefit to clients, employees, and the agency. Systems include Microsoft Office 365, ClearCare, The Hub, Google G Suite, Skype for Business, NEC Phone System, multi-function printers, Google franchise boundary maps, HelloFax, and more. As medication services grow, assign caseloads to medication care coordinators. Ensure appropriate resource allocation and client coverage. Direct and support coordinators in critical decisions and issue resolution. Ensure proper maintenance of in-home client journals. Help with the assignment, distribution, and collection of GrandPad tablets for integrated care. Maintain close communication with agency bookkeeper regarding service starts and stops, client service deposits, payment arrangements, and collections of amounts due. Understand and advise clients on payment options including private pay, long-term care insurance, veterans’ benefits, and other public and private pay sources. Assist with on-call duties as needed. Ensure coverage for new client starts outside normal business hours. Other duties assigned by and agreed upon with the agency director and/or the agency owner. Please apply at https://tigardor.in-home-care-jobs.com/x/detail/a23t5cshf9v8 -- or click apply below. Please note that this is the job board for the franchise office located at 8625 Sw Cascade Ave, Suite 420 Beaverton, OR 97008. Each Home Instead franchise is independently owned and operated. To find a franchise near you, please visit the Careers page. For job related questions please call the franchise office at 503.747-4663. If you have any technical problems with this site please call 919-508-6147 for technical assistance.